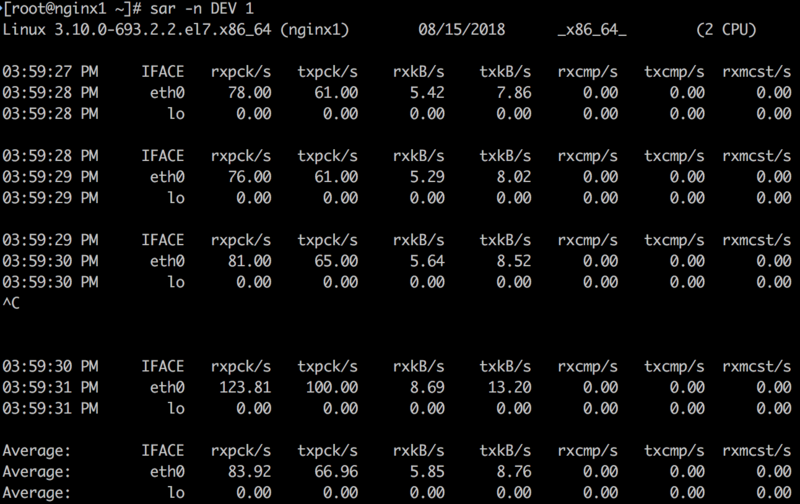 rxpck/s: Total number of packets received per second. txpck/s: Total number of packets transmitted per second. rxkB/s: Total number of kilobytes received per second. txkB/s: Total number of kilobytes transmitted per second. rxcmp/s: Number of compressed packets received per second (for cslip etc.). txcmp/s: Number of compressed packets transmitted per second. rxmcst/s: Number of multicast packets received per second. %ifutil: Utilization percentage of the network interface. For half-duplex interfaces, utilization is calculated using the sum of rxkB/s and txkB/s as a percentage of the interface speed. For full-duplex, this is the greater of rxkB/S or txkB/s. active/s: The number of times TCP connections have made a direct transition to the SYN-SENT state from the CLOSED state per second [tcpActiveOpens]. passive/s: The number of times TCP connections have made a direct transition to the SYN-RCVD state from the LISTEN state per second [tcpPassiveOpens]. iseg/s: The total number of segments received per second, including those received in error [tcpInSegs]. This count includes segments received on currently established connections. 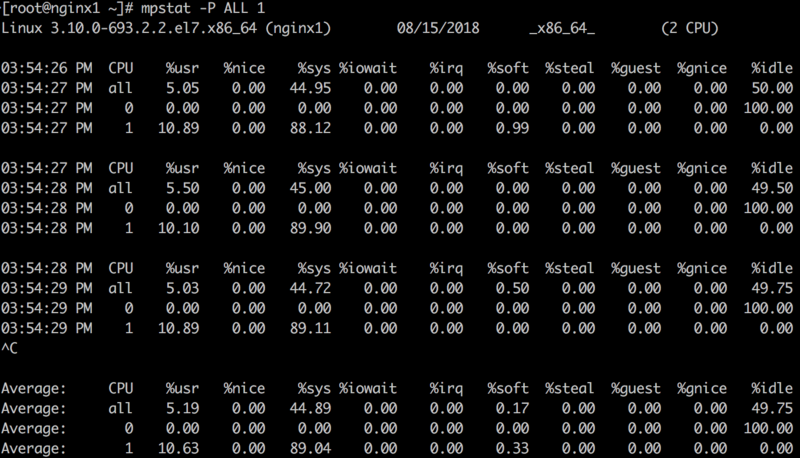 oseg/s: The total number of segments sent per second, including those on current connections but excluding those containing only retransmitted octets [tcpOutSegs]. atmptf/s: The number of times per second TCP connections have made a direct transition to the CLOSED state from either the SYN-SENT state or the SYN-RCVD state, plus the number of times per second TCP connections have made a direct transition to the LISTEN state from the SYN-RCVD state [tcpAttemptFails]. 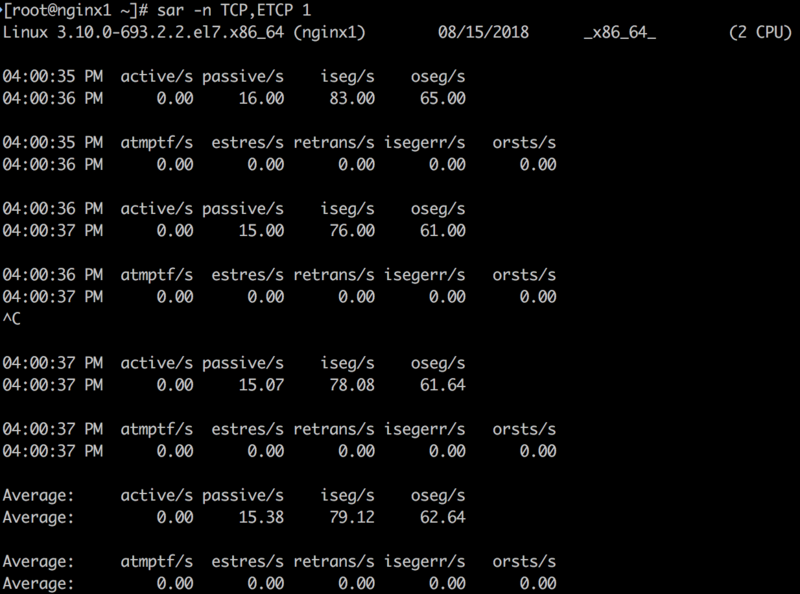 estres/s: The number of times per second TCP connections have made a direct transition to the CLOSED state from either the ESTABLISHED state or the CLOSE-WAIT state [tcpEstabResets]. retrans/s: The total number of segments retransmitted per second - that is, the number of TCP segments transmitted containing one or more previously transmitted octets [tcpRetransSegs]. 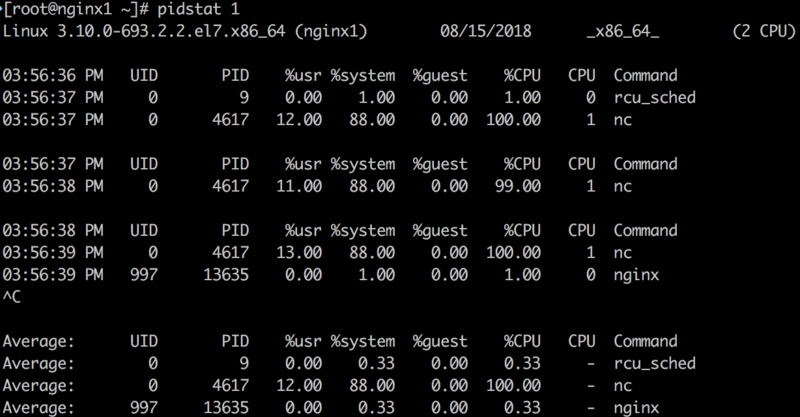 isegerr/s: The total number of segments received in error (e.g., bad TCP checksums) per second [tcpInErrs]. orsts/s: The number of TCP segments sent per second containing the RST flag [tcpOutRsts].